What makes the 7 unique is, first and foremost, that its spiritual side dominates all of its other traits, and secondly, it is highly unconventional. -- yes, all numbers have a spiritual side. What makes the 7 unique is, first and foremost, that its spiritual side dominates all of its other traits, and secondly, it is highly unconventional. And then there is the 7, the Seeker, the lifelong Searcher of Truth. The 7 is usually not committed to any religion, yet devotes more time and energy towards the search for the Holy Grail than a devoted Jesuit priest. It's no coincidence that the 16, potentially the most dangerous of the Karmic Debt numbers, is also a 7, because the 7 is about death and rebirth. Not so much literally, but in its tendency to throw away material success when it perceives it as a threat to its spiritual growth. And when the 7 is based on the 16, it makes those choices often by impulse and without considering the consequences, hence its Tarot-inspired nickname of "The Fallen Tower." Another thing that all numbers have in common is intelligence, of course. There is no single-digit number that is smarter than the others, however, the way they use their intelligence is very different. The intelligence of the 2 is intuitive, the 4 is methodical and highly rational. The 5 is fast as lightning, while the 6 takes its time. The 9 sees the larger picture, the 8 is the visionary, the 1 is cunning, and the 3 thinks outside the box. And the 7, you guessed it, is the scholar, the reader, the gatherer of information. In its search for clarity and insight, the 7 takes that same approach. It devours books on philosophy, theology, etc. It loves scriptures, including those of the more obscure religions, and asks more questions than a thousand wise men can answer. And that's why I love the 7. There are people who believe that yes, there is a God (or more than one). There are people who believe that no, there is no God. (Life is random? Either way, the difference between group 1 and group 2 is negligible, as both rely on a belief.) And there are people who admit that there is no way of knowing either way (Agnostics). The 7 symbolically (a keyword here) represents the fourth group, the all-but-forgotten ones, those who fly under the radar and are rarely mentioned and almost never acknowledged. They are the folks who (drum roll please), feel in their guts, that if God exists, He must be knowable. They have no interest in a God based on belief, nor are they inclined to accept the concept of no God based on not believing (bad sentence, but you get my drift). What they want is one thing and one thing only, and that is to know. Now, before you think to yourself that, well, isn't that what we all do? All of us who go to church, who pray, who have faith, who are faithful to our faith? As well as those of us who don't believe? Don't we all know or seek to know? Well, no, you don't, hence the word "belief." Meaning "I don't really know, but will accept this or that as a truth because everyone else does, or because my parents did, or because I wanted to marry a person of this or that faith, or for whatever reason." Which is why you will have no trouble whatsoever finding a person who has been a fervent believer all of his or her life, yet when it comes time to die, that person will fight and beg for one more breath. How does that fit with a belief in Heaven and a loving God? You also won't have any trouble finding a person who does not believe in God, that when you die it's all over, time no longer exists, everything is dark and so forth, and that person, too, will fight and beg and suddenly start calling out for God, the moment death comes knocking on his or her door. Now, please, I am talking about symbolism, and the number 7 in particular. I don't have any interest in telling you that God exists or does not exist, or what He looks like, or whether this religion is superior to that one, or any of that. I only want to point out the unique spiritual essence of the 7, because no matter what your numbers are, if a little bit of that rubs off on you, it can only help you. 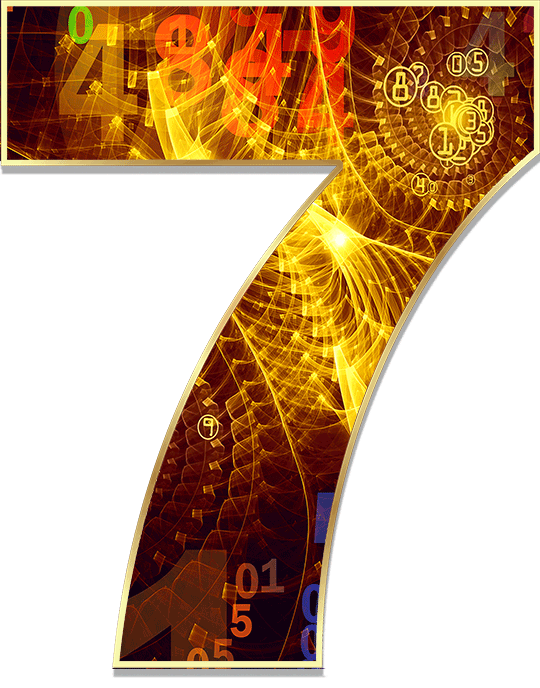 The essence of the 7, the quality that makes it different from all other numbers (symbolically speaking), is that it pursues knowing as opposed to believing. It will never accept any belief one way or another, and yet it is far from agnostic. In fact, it is at the opposite end of the spectrum, it is convinced that if God exists, He can be known. Let me tell you, the 7 has got its work cut out for it! Or perhaps, as some believe (there is that word again), the stubborn, persistent search of the 7 motivates God (if He exists) to walk a thousand miles toward the 7, for every inch the 7 moves towards Him. See, the thing is that you may or may not believe in God, but there is no denying that Love exists. And I am pretty sure that is exactly what Love would do.